Japan is full of terrific food, and the Fuji Five Lakes are a veritable cornucopia of tasty treats. Sampling local dishes often means eating in sync with the seasons and offers a window to local traditions, too, which is about as green as a tourist could ask to be. Thoroughly chilled and starving from our longer-than-intended bike ride, we ventured off to try the local specialty - houtou udon - recommended both by the farmers and the hostel staff. The noodles are thicker and wider than regular udon, and are served in a piping hot bowl of miso-based broth with an absolute ton of vegetables. It sounded like the perfect thing to warm us up. We ate at Kosaku, about a ten minute walk from our hostel, where houtou can be ordered with everything from seafood to wild boar to bear. We kept it simple with the straight vegetable variety - big chunks of kaboucha (Japanese winter squash), pea pods, bamboo shoots, carrots, potatoes (regular and satoemo), and long onion - and had no regrets. (One of our table companions gobbled up his seafood version, but asked for assistance with the horse sashimi. Another traditional food, the raw meat is served chilled with freshly grated ginger.) Seated in the huge tatami-matted dining room the houtou arrived steaming in cast iron bowls, and was a dish simply to die for. 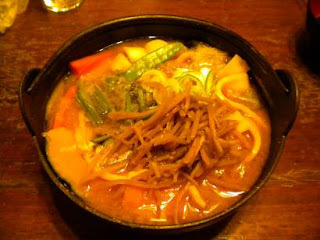 The squash melted in our mouths, and lent the broth a fine texture and taste that accentuated the other vegetables. It was the perfect belly warmer. Fill a medium-sized pan half-way with water or about six cups. Stir in the miso, which will begin to dissolve as the water warms. Add the dashi and soy sauce to taste. I usually aim for a bit more than less on these two, although it takes some practice to not overdo. Toss in the remaining ingredients, with the exception of the pea pods. Simmer until the squash and the potatoes cut easily with a knife. Add the pea pods at the very last so they are just gently steamed or heated through. They should be bright green with a bit of crunch by the time they arrive at the table. 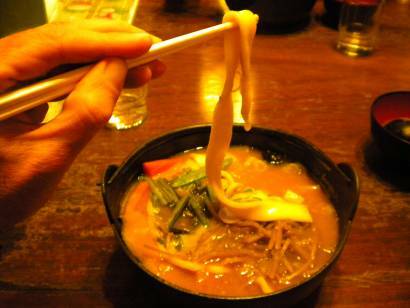 *Udon noodles are relatively easy to make at home, although authentic houtou noodles do not contain salt and are not precooked. The noodles are cooked with the other ingredients in the soup. This basic recipe would work. This certainly brought back some great memories of the food in Japan. Loved the pics. Thanks! Glad you liked it. It's definitely become one of our favorite dishes.